It’s early January of 2012 – one year ago. 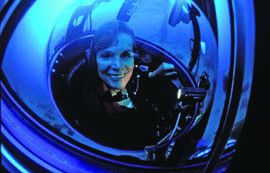 While most of us are still struggling to come back from our holiday overindulgences, Dr. Sylvia Earle is on the move. Diminutive only in stature, 77- year old powerhouse and marine explorer Dr. Earle is boarding the plane that will take her on an expedition to one of the largest marine sanctuaries in the world, Papahãnaumokuãkea Marine National Monument, known to most of us as the Northwest Hawaiian Islands or Midway. There, she will dive with sharks, witness masses of plastic washed up on the shore from the Pacific Garbage Patch, and personally meet the oldest living bird in the world – a Laysan Albatross named Wisdom. the state of the ocean at the World Economic Forum in Davos, Switzerland, been on the Climate Reality Project cruise to the Antarctic with fellow Ocean Elders Al Gore, Richard Branson and Ted Turner, and given the keynote address at The Economist World Oceans Summit in Singapore. She often refers to the earth itself as ‘The World Bank,’ as it is in fact where all of our resources are. Called ‘Her Deepness’ by The New Yorker and The New York Times, Living Legend by the Library of Congress, and first Hero for the Planet by Time Magazine, Sylvia Earle is a worldrenowned oceanographer, explorer, author and lecturer. Formerly Chief Scientist of NOAA, she is a National Geographic Explorer in Residence, Founder of The Sylvia Earle Alliance and Mission Blue, Deep Ocean Exploration and Research, and the Ocean in Google Earth. One of the world’s most prominent oceanographers, Earle has led more than 100 expeditions and logged over 7,000 hours underwater with a record solo dive to 1,000 meters and nine saturation dives including leading the first team of women aquanauts during the Tektite Project. She has been awarded more than 100 national and international honors. At any given time, you can find Dr. Earle traveling the world, speaking to summits and governments about the historic challenges our planet faces and what we can do to help. Next you’ll find her at a beach cleanup in Texas, engaging kids in a lively discussion about what happens to sea turtles when plastic garbage bags end up in the ocean and are mistaken for their favorite dinner, jellyfish. Dr. Earle is one of a group of living witnesses – older divers and sailors who have seen the degradation of the oceans. With 90% of the big fish already gone, coral reefs disappearing worldwide, the crisis of climate change and ocean acidification, Dr. Earle’s message is that we must act now if we are to preserve the very systems that keep us alive. “Everyone can do something,” she says. This wish became an initiative within The Sylvia Earle Alliance called Mission Blue™—to build a global coalition to improve ocean protection measures and restore the health of the ocean. Since its inception, Mission Blue has been growing in scale; building interest and momentum with partners around the world. The vision of Mission Blue is to increase marine protected areas from just over 2% to 20% by 2020. Dr. Earle has identified ocean areas around the globe that deserve special attention and elevated protection, which she calls Hope Spots. Expeditions are planned for 2013 and beyond to explore and monitor these critical marine areas. You can support this effort to restore ocean health. If you’d like to learn more about Mission Blue’s work and what you can do to help, please visit us online at mission-blue.org or on Facebook or twitter. Life Jackets Save Lives – Have It On?